AP EAMCET 2019: Andhra Pradesh Engineering Agricultural & Medical Common Entrance Test is organized by the Jawaharlal Nehru Technological University Kakinada, Andhra Pradesh on behalf of APSCHE. Latest Update: AP EAMCET 2019 Admit Card is expected to be released very soon. Keep Visiting for more info. 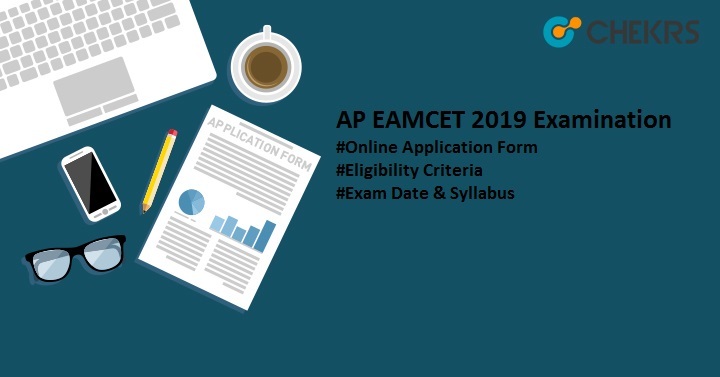 Latest Update: AP EAMCET 2019 Application Form is open Now!! Check Procedure Below. Complete Schedule is also announced. Latest Update: AP EAMCET 2019 Notification has been released. The application form is releasing from 26th February 2019. Check Below. Latest Update: AP EAMCET 2019 Activity Schedule has been released. Check Below. Latest Update: AP EAMCET 2019 Exam Dates has been Announced!! Check the Dates below. EAMCET is a state level examination which is conducted to offer the admissions in various professional courses at Under Graduate and Post Graduate level in the University as well as affiliated colleges in Andhra Pradesh. The Application Form will be released in the 4th week of February 2019. Applicants can check the full article on AP EAMCET 2019 Application Form for the detailed information. The Eligibility Criteria required to appear in the AP EAMCET 2019 is given below. Domicile: The applicant must possess the state domicile of Andhra Pradesh. The applicant must specify the proof of local or not local of Andhra Pradesh. The Applicant must have following subject at intermediate level/ Diploma level that are Physics, Mathematics or any one of the Biology, Chemistry, Computer Science, Economics. The Applicant must have diploma or intermediate level from State board of Andhra Pradesh as required in Eligibility Criteria. For PG it requires a bachelor degree of 3 years from any recognized university. It is mandatory to score 45% in Diploma / Intermediate level (10+2) in General category. It is mandatory to score 40% in Diploma / Intermediate level (10+2) in Reserved (ST, SC, OBC and PWD) category as required in Eligibility Criteria. The applicant must be 16 years on 31st December 2019 for Minimum Age, there is no Maximum Age Criteria. Candidate must visit the official site to Fill the AP EAMCET Application Form. Then go to the AP EAMCET 2019. Once your link is opened. Read the instruction for requirements for documents and payments. First you have to pay the required fees through the APonline Transaction Id if the payment is made by the cash through Aponline center, Credit / Debit Card and net Banking. Once you paid the fees, you have to fill the qualifying exams details like Hall Ticket Number, Marks Memo if already appeared. Appearing candidates will not fill anything. Then you have to choose the stream for which you want to apply for. Engineering or Agricultural and Medical or Both the stream. Now enter your personal details- Date of Birth, Address, Mobile number, etc. Now enter Your SSC mark sheet details as well as Hall Ticket number and equivalent details. Now you have to fill the local status as well as your domicile certificate details. You have to even submit annual income details of both of your parents. Enter your Reserved Category Details. Enter your Aadhar Card Details. Once you fill everything then submit the application form. You can have the correction link in second week of April, 2019. So you can check the details if you want to change or correct anything. Then you can submit the form and the print out for the future reference. AP EAMCET Syllabus are as follows. For Engineering: Physics, Chemistry, and Mathematics. After filing the form, you should start framing your plan to cover the entire syllabus. When you done preparing the plan, execute the plan effectively. Time Management is very important for utilizing time efficiently. Divide the syllabus in topics with the level easy, medium, hard. Give more time to the hard ones so that u can understand well and give less time to easy one. Speed and Precision will help you to score higher marks with good ranks overall. Make your own records of study material you are using. That will help you to learn very easily. Stay focused and confident. Never give up trying. Drink lots of water and keep calm. Take 5 minutes break as stress buster e.g. listens to your favorite sons. AP EAMCET 2019 Sample Papers/Online Mock test If you have filled the form, then the next thing is how to prepare for the AP EAMCET 2019. All the AP EAMCET Previous Sample papers are very important as they help you to improve your skills like, Concepts, Time Management, etc. for the Examination Process. These sample papers have questions related to every topic and covers almost all the syllabus and prepare you well for the AP EAMCET 2019. The Online Mock Test will increase your speed and accuracy and where you stand in the preparation. The Hall-Ticket of the exam will be available on the Third week of April, 2019. You can download AP EAMCET 2019 Hall-Ticket from the official website i.e. www.scheap.gov.in. Once you downloaded it, take a print out and sign it. AP EAMCET Answer Key: It will be available for Engineering and Agriculture/ Medical on the Last week of April, 2019. AP EAMCET Answer Key on the internet and official website after 2 days of Exam Date. The AP EAMCET Result will be available on the official website of the site i.e. www.sche.ap.gov.in on the starting of the seconding week, 2019. AP EAMCET Counseling The counseling will start within three weeks of the results date. The applicant should go to the AP EAMCET Counseling with AP EAMCET Score Card Rank, 2019. Dear User! You can put your query in below comment box, we will response you as soon as possible.